NES The Krion Conquest (USA) in 13:21.12 by Shinryuu. The Krion Conquest is a platform game remarkably similar to the early Mega Man games - so similar that it's pretty easy to consider it a rip-off. This movie by Shinryuu is 3:10 faster than the previous TAS by Acmlm. 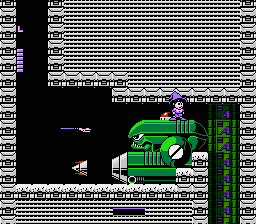 Much of this improvement is gained by utilizing the various glitches in the game, which are also similar to the Mega Man series—using items to get into walls and move through them at fast speeds.